4.1 Is there any pre-requisite knowledge required for any of the classes? 4.2 Do I need to be anywhere in particular to attend a class? 4.3 What if I have questions? 4.4 I have a question about classes now. The primary purpose of EVE University is to teach new (and old) players about the basics of life in EVE and various aspects of game play. To that end we hold regular classes, both theoretical and practical, in order to accomplish this goal. This page contains information on how to attend our classes, or, if you are unable to attend a live class due to time zone differences, how to find recordings and transcripts of our previous classes. Please note that most of our classes are public! You do not need to be a member of EVE University to join! If you are interested in giving a class or lecture yourself, then you can find out about Joining the Faculty as either a teacher or a guest lecturer. Alternatively, if your skills lie primarily in the practical fleet command area, we have a Guest FC program. So you want to attend a real live class? The first step is finding out when our classes take place. You can find all this information on our Calendar page. Note the links at the bottom of the page, which will allow you to import the information into your calendar application of choice, be it Outlook or iPad or whatever. 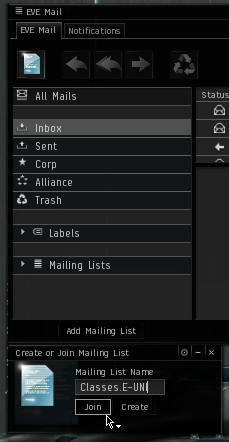 We also have an in-game mailing list - please open in the EVE Mail application in-game, click the Add Mailing List in the bottom left hand corner of the EVE Mail window, and add the mailing list Classes.E-UNI (see image to right). Messages are generally sent out once per week to advise of upcoming classes and events. Capsuleer Orientation Related Education (CORE) classes are designed to give brand new EVE players an introduction to a broad range of game mechanics that will form a solid foundation of information to be expanded upon throughout your EVE career. CORE Classes are designed to be easily understandable, include a visual guide that will assist attendees through the presentation of class information, and usually take 30-45 minutes to cover (not including Q&A). CORE classes can be ideal for non-Uni pilots who may choose to attend a class on a whim during an otherwise-normal play session. For information about available CORE subjects, or instructions for attending CORE classes, please see the CORE classes article. Download & install the latest version of Mumble from the developer's website. During the set-up wizard on first launch, make sure to set a push-to-talk key. Do not use voice activation. Open your new Mumble, click Server -> Connect, click the Add New... button at the bottom. Add a connection that looks like the image below (note that the port number is not the default). Congratulations, you are now on our public Mumble server. We have a number of classroom channels on the public Mumble server; most classes are held in the first one (Classroom 1). We maintain an in-game channel that is used, during classes, for students to ask questions and for the teacher to link in-game items or images, graphs, etc. This channel is Lecture.E-UNI. 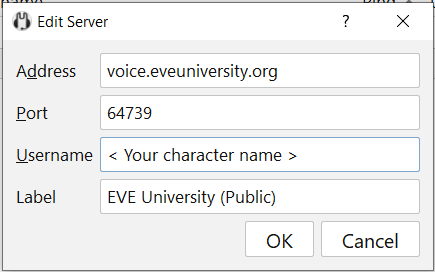 You can join this channel by clicking the small speech bubble icon just above your chat window, and typing Class (EVE Uni) into the box that pops up. Press Join, and you are now in the E-UNI public class channel. We also have a public channel (simply called E-UNI) for new players to ask questions about EVE and EVE University, feel free to join it for any help with the game you may require! Occasionally our teachers will hold classes in other mediums, such as a different server, or through Twitch.tv or similar. If this is the case all the details will be found by looking at the relevant post in the Scheduled Classes forum (linked above). Is there any pre-requisite knowledge required for any of the classes? Usually, no. If there is, the relevant post in the Scheduled Classes forum will tell you all about it. Do I need to be anywhere in particular to attend a class? Usually, no, although practical classes sometimes require you to be in a specific system in EVE (you can always just listen in to the practical part even if you can't take part). If you do need to be somewhere, the relevant post in the Scheduled Classes forum will tell you all about it. Normally you can ask any questions you may have during the class in the Lecture.E-UNI in-game channel. If a different channel is being used for this class, the relevant post in the Scheduled Classes forum will tell you all about it. I have a question about classes now. Ask in the E-UNI in-game channel! Or if that doesn't produce an answer, feel free to Evemail Jason Eoner, Adree Jericho or Jacob Velora. You can find a large number of previously recorded classes at our Class Library page, available for download in MP3 format and listening to in your own time on your own MP3 player of choice. Many of our teachers create slideshows in PDF formats as highly useful teaching aids. You can find all of these on our fancy slideshow viewer. Please note that these do not necessarily contain all of the information that you would otherwise find in the class recording or syllabus. This page was last modified on 10 February 2019, at 15:53. This page has been accessed 123,231 times.